The 54th Annual Avon Lake Band-A-Rama will feature bands from Ohio. This is a judged event sanctioned by the Ohio Music Education Association. 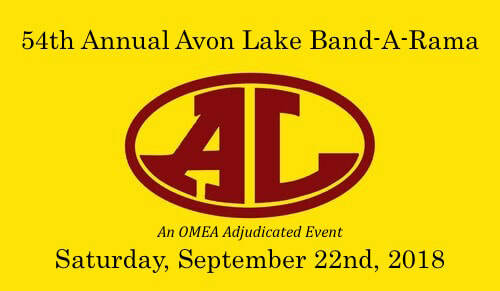 The Avon Lake Band Aids hosted the 50th Annual Avon Lake Band-A-Rama on Saturday, September 13th in Memorial Stadium. The show featured eight bands including Oberlin, Clearview, Keystone, Padua, Rocky River, Brookside, the Massillon Tiger Swing Band, and the Avon Lake Marching Shoremen. Harry Pfingsten, Avon Lake Band Director from 1964-1991, who hosted the first Band-A-Rama in 1964, was honored for starting this outstanding band festival.